(Phys.org)—A new study by a team of chemists in Greece has added credence to a theory that suggests that humans differentiate smells by sensing molecular vibrations, rather than through simple binding to receptors. In their paper published in the journal PLoS ONE, the researchers found that deuterating a compound with more hydrogen atoms than had been tested in previous research, resulted in test subjects being able to distinguish between two nearly identical molecules with two distinct vibration frequencies. For several years there has been a debate in the biological chemistry field regarding how humans distinguish between smells. Prior to the debate, the consensus had been that molecules in compounds bind to receptors in the nose and respond according to fit – rather like pieces of a jigsaw puzzle. That theory was challenged by a team of Greek researchers, led by Luca Turin who claimed that molecule shape alone could not account for differences in smell perception – they suggested in 1996 that people distinguish smells through a process of quantum tunneling whereby molecular vibrations allow electrons to tunnel between receptors. Turin et al's ideas were delivered a blow in 2004 when another team of researchers in the U.S. tested the theory on live human subjects. They asked volunteers to sniff samples of deuterated (swapping out the hydrogen atoms in a molecule for deuterium to change the frequency of the vibration) and undeuterated acetophenone to see if they could tell the difference between compounds that were nearly identical except for their vibrations. They team found the volunteers were not able to detect a difference. Then, in 2011, Turin and his team showed that fruit-flies were able to differentiate between the very same compounds, suggesting their vibration sensing abilities were sharper than humans. In this new effort, the researchers replicated the experiment run by the rival team in 2004, and found nearly identical results. But because of their success with the fruit-flies, they theorized that perhaps the problem was with the compound being tested. Acetophenone has just 8 hydrogen atoms. 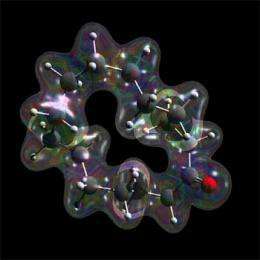 They ran the experiment again, only this time used cyclopentadecanone, which has 28 hydrogen atoms. This time, they report that the human volunteers were able to tell the difference. And this they say, adds weight to their theory of quantum tunneling. Both sides agree that the final proof of which side is correct will only come about when someone devises a means to study the process of odor identification up close – close enough to actually watch the binding that occurs between molecules and sensors, or sees tunneling going on. Whether olfaction recognizes odorants by their shape, their molecular vibrations, or both remains an open and controversial question. A convenient way to address it is to test for odor character differences between deuterated and undeuterated odorant isotopomers, since these have identical ground-state conformations but different vibrational modes. In a previous paper (Franco et al. (2011) Proc Natl Acad Sci USA 108:9, 3797-802) we showed that fruit flies can recognize the presence of deuterium in odorants by a vibrational mechanism. Here we address the question of whether humans too can distinguish deuterated and undeuterated odorants. A previous report (Keller and Vosshall (2004) Nat Neurosci 7:4, 337-8) indicated that naive subjects are incapable of distinguishing acetophenone and d-8 acetophenone. Here we confirm and extend those results to trained subjects and gas-chromatography [GC]-pure odorants. However, we also show that subjects easily distinguish deuterated and undeuterated musk odorants purified to GC-pure standard. These results are consistent with a vibrational component in human olfaction.